ADT Motorcycle Training conducts training for various motorcycle license categories such as direct access, restricted licenses, and advanced training. Our training takes place in courses of 4-6 days. Your tests will be on the last day. ADT offer individual lessons also, so if you're looking to take things slow, call us to discuss your options. Before starting training for your main motorcycle test you have to complete a motorcycle theory test (unless you have completed a motorcycle test previously. Click here to book your theory test through the DSA. There are currently 2 main options for full motorcycle licenses. This license is can be obtained when you reach 19. ADT will provide you with a 500cc machine for training and test for this category. Once you've passed you practical tests, you will be allowed to ride any bike up to 46.6 hp. Ask your motorcycle dealer about the power of any bikes you may be considering buying. It is possible to have almost any bike restricted to 46.6 hp too. Feel free to contact us if you have any questions about bikes which fall into this category. In order to take this test, you must be over 24 or have held an A2 license for at least 2 years. ADT have a fantastic fleet of 650cc machines to use for this test (click here to see the bikes). When you pass you test on one of our 650cc bikes you will be allowed to ride any sized bike with your new license. You will start you training for direct access on either a 125cc or a 500cc machine (depending on your experience and course-length). Have a look at the notes at the bottom of this page for information on other license categories. The 4-day course is designed for those confident, current riders who want to move up to a bigger bike. If you've had considerable experience on a manual bike than this might be the course for you. The 6-day course is designed for beginners, it will start on a 125cc, and then progress to a 500cc and 650cc machine when your instructor feels it is appropriate. If you have little or no experience on manual bikes, then go for the 6-day course. ADT have stood out from other training schools for over 20 years. 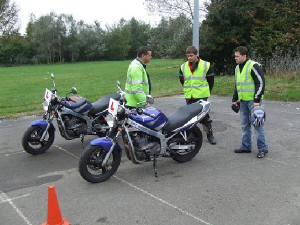 Our training will ensure that you are not just prepared to pass your motorcycle test, but are also prepared for a lifetime of safe and enjoyable motorcycling. We won't teach you make unnecessary observations and treat every junction in the same way, we will teach you to look at every situation and judge for yourself how best to deal with it. Some of customers have left feedback at www.facebook.com/adtmotorcycletraining so see for yourself the kind of reactions we have. We never charge our pupils insurance excess, and we will never charge extra for fuel, beware of those who do. You can take this test on a moped when you're 16. This doesn't allow you ride anything bigger than a CBT will, however it will give you the option of removing the L-plates and taking passengers. You can take this test on a 125cc machine when you're 17. Just like the CBT you will be allowed to ride a 125cc machine (14.6bhp maximum), but unlike a CBT you will be allowed to use motorways and take passengers, and you won't need to have L-plates or re-take after 2 years. All of the licenses listed above are available with automatic restriction. This means that you will take your test on an automatic bike (scooter) and your license will only allow you to ride an automatic bike thereafter. This is ideal for those who don't wish to tackle the clutch/gear layout, or only intend to ever ride scooters. Feel free to call us 02380 337351 if you're unsure as to which training option you need. We have a huge off road training site which is more than big enough to practice ALL module 1 test excercises at the speed required for test. kind of feedback our customers leave.